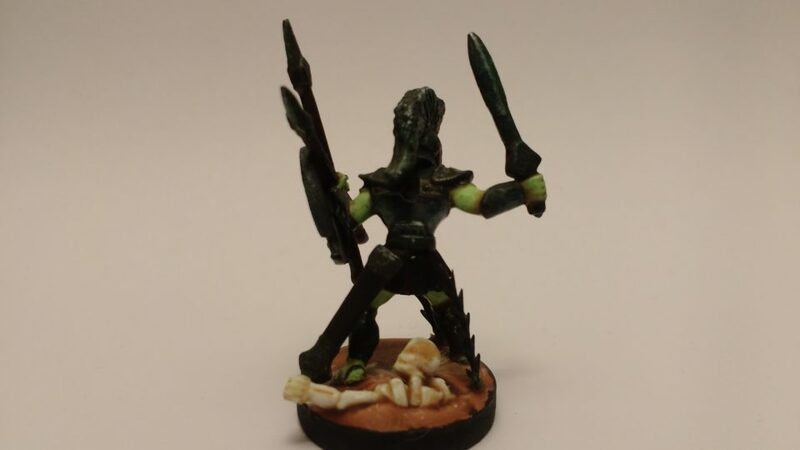 I decided to challenge myself by entering Michael Mordor‘s monthly Reaper miniature painting contest for January. It’s great motivation to try new things rather than settle into what’s comfortable. 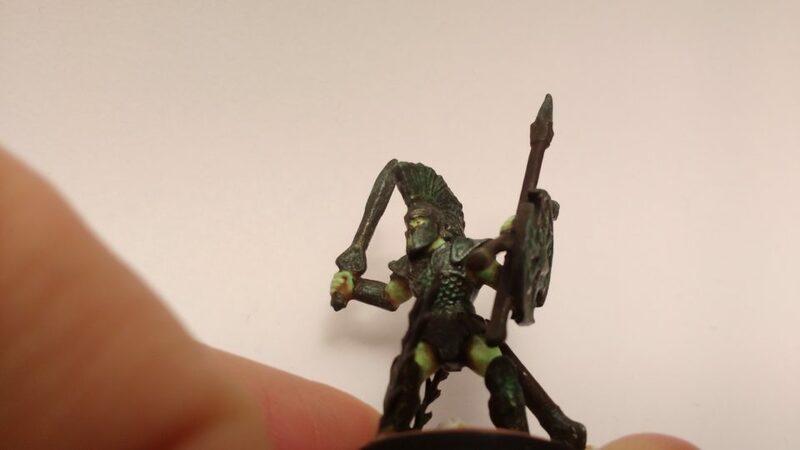 I decided to paint the Urian Spartan Warrior miniature primarily because I’m whimsical and impulsive… In this case, that means I picked this one because the shield with crossed spears reminded me of the trophy with crossed paintbrushes. I had seen an article in the news a few weeks ago about antique Greek weaponry and that inspired me to go for a spectre wielding ancient bronze equipment. I thought it would be fun to have a skeleton on the base, glowing faintly, with it’s ancient bronze armaments animate once more on an ectoplasm body. Also, aside from being fun, this would be a broadly useful miniature in Pathfinder, Starfinder, and many other tabletop ventures. I experimented by priming the flesh with black gesso and the rest with white gesso. I thought this might impact visibility down the road but I think it didn’t make a difference as repeated coats of paint completely obscured the primer. After applying the various overcoats I set the miniature in an upside-down base filled with plastic cement (drilled a hole through it’s original base to help lock it in place) and then molded some terrain on with air-dry clay. 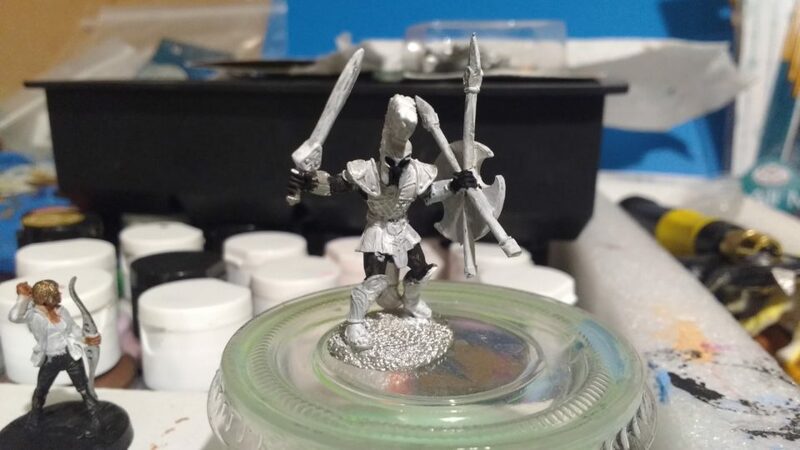 I cut up a skeleton archer from the original Reaper Bones Kickstarter and used it for Urian’s skeleton. I took a few snippets from an aquarium plant and added them so there was slightly more going on. Then I did a ton of drybrushing with neon paint on the ectoplasm and metallic paint in splotches on the aged bronze. I considered deviating from my standard approach and forgoing the polyurethane…but contest or not, I want my miniatures sturdy. So this one took two DIPs to lock things down and toughen up the paint job. Finally, I drybrushed on some neon green frosting to the bronze and locked it all done with a final coat of spray on matte varnish. Originally I had tried the eyes neon yellow and then pure white, but I finally I decided to put two bronze circles on them (representing the coins used to pay passage to the afterlife in Greek Mythology). The physical remains of Urian…cheering on his ancient armaments animated once again by his spectre. θάνατος οὐδὲν διαφέρει τοῦ ζῆν. I tried to get an eerie mist effect swirling from the skeleton to the feet of the spectre. It kind of worked out…but definitely wasn’t quite as evocative as hoped. 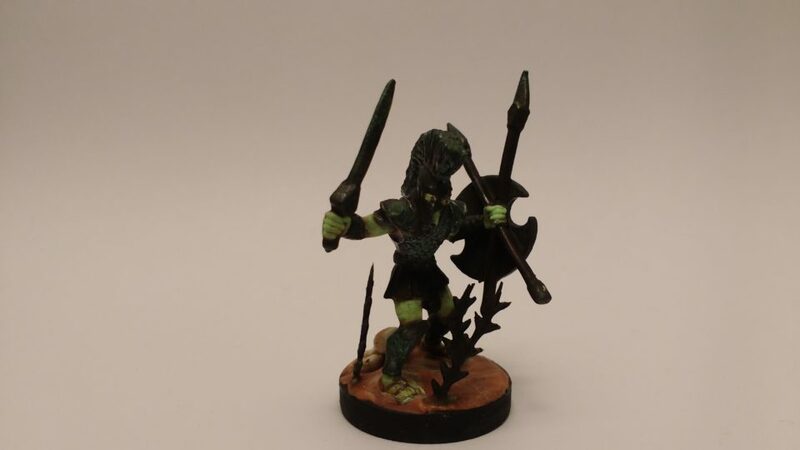 My phone wasn’t capturing the bronze frosting too well – will have to get a proper camera eventually – so I angled the miniature to show it.